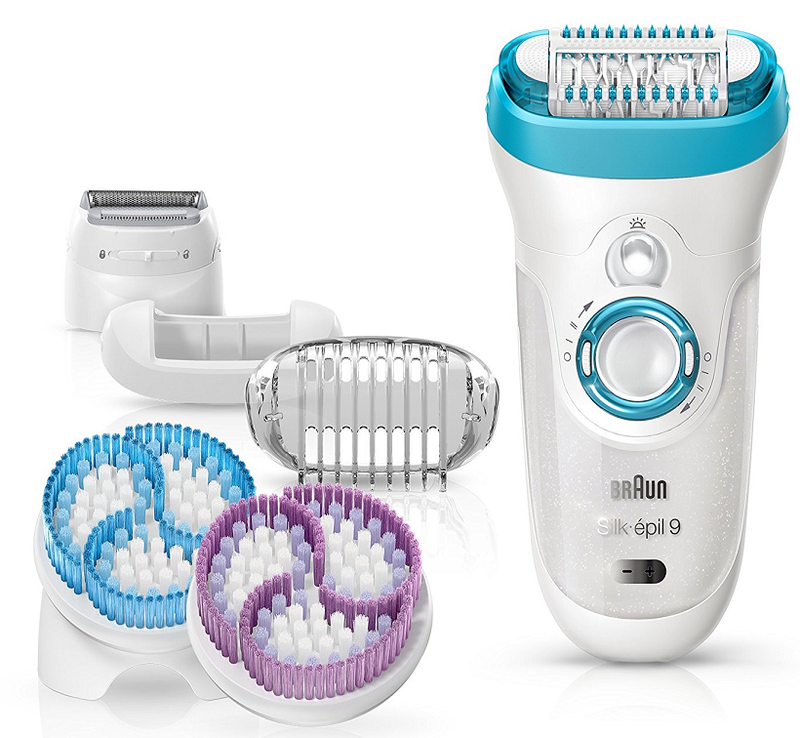 The Silk Epil 9-961e from Braun is not just an epilator – it’s a full skin spa kit. 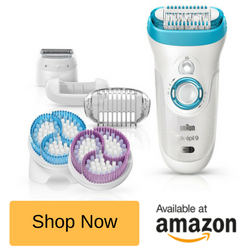 If you’re looking for the most efficient epilator with exfoliating tools that will leave your skin completely smooth and radiant, then Braun’s Silk Epil 9-961e Skin Spa is right for you. 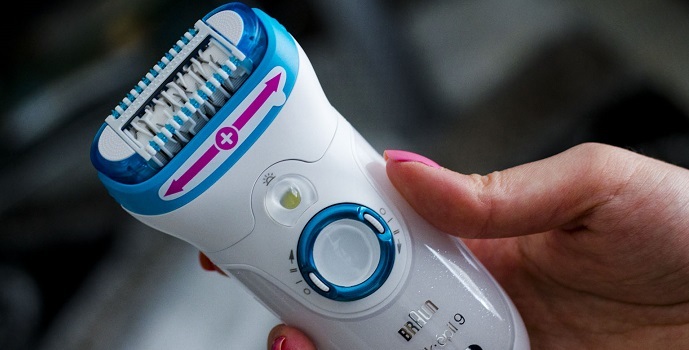 In this review of the Silk Epil 9-961e Wet and Dry Cordless Epilator, you’ll discover why this really is the new standard in skin beauty, and why this is now Braun’s top of the line, premium offering. The Epil 9 comes with a variety of attachments and accessories to make this the most efficient, all-in-one hair epilation and skin exfoliation system. But before we get to the accessories, let’s talk about the epilator itself. The first thing you’ll notice about this Braun epilator is how nice it looks. It’s pure white, with fresh blue and silver glitter trimming, and beautifully shaped. It’s very light and easy to use, with a round switch on the front that has two setting – fast or slow. The epilator head is where Braun leaves the competition standing, because it has newly designed micro grip tweezers, and a width that’s around 40% wider than other Braun and Philips epilators. What’s more, MicroGrip Tweezer Technology will grip and pluck the thinnest of hairs, as short as half a millimetre, that’s right, just 0.5mm. That means you don’t need to wait until your hairs have grown back in to a suitable length that’s long enough to be waxed, or epilated, making smooth hair free skin much easier to maintain. In fact, it’s been shown to be more effective than waxing, picking up hairs too short for wax to grip. And the wider head means you’ll be able to capture more hairs with fewer strokes. Finally, the epilator tweezers are built on a tilting, pivoting head, designed to adapt to natural contours on the body. This feature is particularly helpful when epilating underarms, and around knee and elbow joints. Also, there is a row of vibrating wheels at either side of the epilator tweezers, to help provide extra comfort. Now, what about the attachments? With the Braun Silk Epil 9-961e Skin Spa you get two exfoliating brush heads – one blue and one purple. The main brush head you want to use is the blue one, as this has firmer bristles and is used for deep cleaning and exfoliation of the skin. It’s best used before epilating, to remove dead skin cells, so that all the hairs are loose and ready to be scooped up and plucked from the root. In fact, the results are comparable to professional exfoliation by thoroughly removing dirt and dead skin cells, and stimulating the regeneration of new skin cells. Because the brush head oscillates at 3,000 vibrations every minute, has 10,000 specially shaped, high performance bristles, and is designed to hold and evenly distribute shower gels and scrubs within the bristles. The process dramatically reduces you’re chance of getting ingrown hairs, and refines skin – it’s the “remove and restore” philosophy inspired by dermatologists. The purple brush has softer bristles and is milder on the skin for use on sensitive areas. To attached the brush heads you simply click a release button located on the back of the epilator that will remove the spinning tweezers, then simply click the brush head on and you’re ready to go! 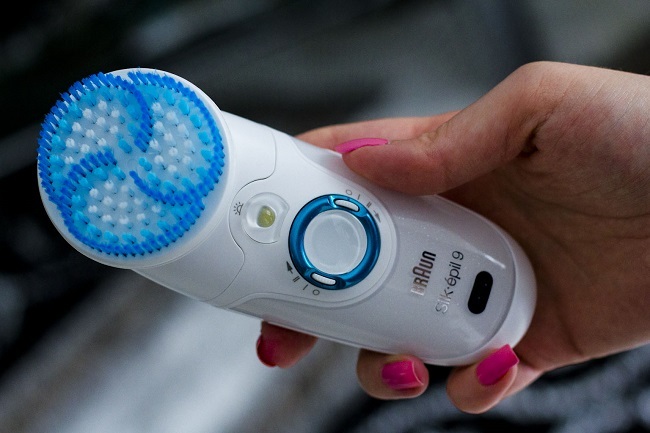 Braun suggest that you use the brushes to exfoliate once per week, or at least one day before using the epilator to remove hair. 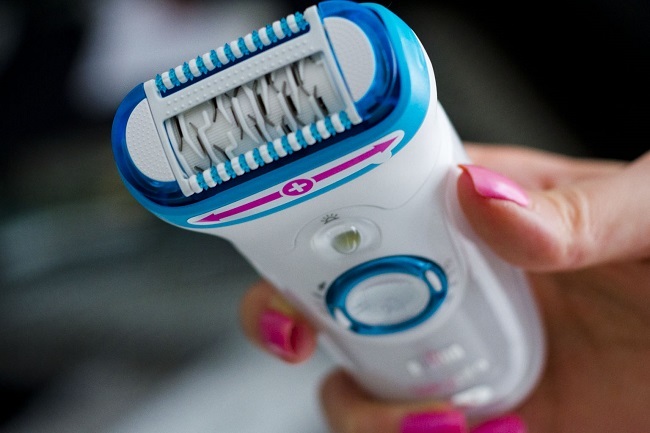 This attachment is just awesome – with a couple of clicks and a change of heads your epilator turns into a fully functioning foil electric lady shaver. This is not some cheap, gimmicky attachment, it’s a full-blown quality Braun shaver and trimmer, which is super handy for trimming hair around the pubic area, and for other places on the body that you might find sensitive or awkward with the spinning epilator. Some areas and hairs are better shaved than epilated, but this varies from person to person, you’ll know which places to shave vs epilate. You’ll get a little cleaning brush to help keep your new epilator clean, and free from clumps of hair building up. Some kits come with a green deep massage pad, and you’ll get a nice bag to keep everything in, which is also really handy if you’re traveling. There is no need to buy batteries, as it has a long-lasting built-in rechargeable battery. Charging the battery is easy with the supplied charger cable, and the internal battery is fulling charged within one hour. When the battery is fully charged, you’ll get around 40 minutes of continues operating power. The Silk-épil 9 does not operate when plug into the main, for obvious safety reasons (using around water), it’s operated cordless. You might find that your bathroom lighting is quite dim, and seeing small, thin hairs difficult. It’s not always easy to see the hairs you’re trying to remove when you shave, or epilate your legs, even in a bright room. 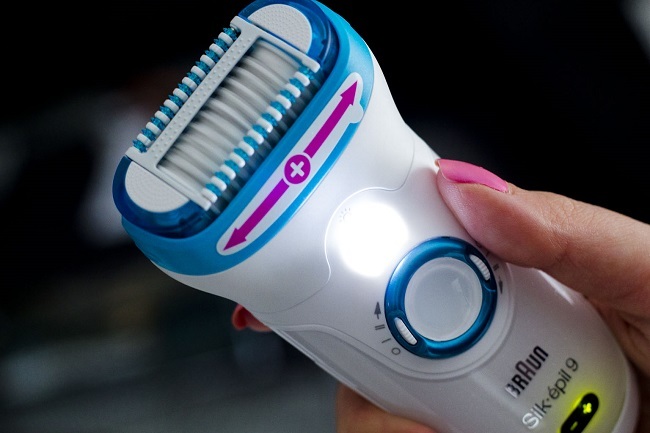 That’s why Braun has built-in a little – appropriately named – “Smart Light” LED strategically mounted and angled on the front of the Silk Epil 9 epilator. It works by shinning a bright light on your skin, illuminating the path of epilation, so that you’re able to clearly see every hair, so you won’t miss a spot. Another great feature is the 100% waterproof design, that allows you to use the epilator in the bath or shower. Some people prefer to epilate on wet skin/hair, after bathing, because this can soften the hairs and reduce pain and the prickly sensation, but this is a personal preference thing. Other people much prefer epilating dry hairs, as they find this method more effective. 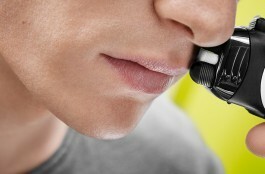 Whichever method you prefer – wet or dry – the Braun Silk Epil 9-961e accommodates. Braun designed this epilator to beat the competition, to create the very best product possible. Think about that, a group of Braun product developers analysing all the top epilators on the market and trying to come up with something better – that’s what you’re getting here. It’s an extremely efficient machine with a bunch of useful accessories and features! Reviewers are reporting exceptional hair removal that leaves their skin smooth and irritation free. See the “Key Features” at the top of this page for our list of positives. The only real negatives we could find were from people who experienced excessive pain, and skin irritation. We also had some reports from people who said that a lot of the hairs caught by the epilator where broken, instead of plucked. 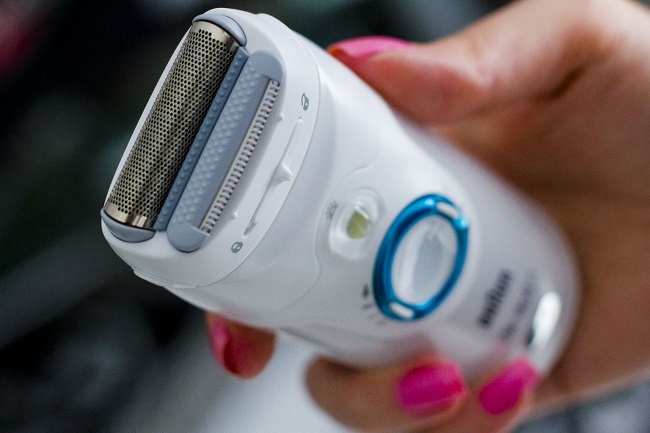 It’s our opinion that a lot of these reports are from people who are not suited to epilation, just like some people experience ingrown hairs and massive irritation from shaving, the same goes for epilators, it might just not be for you. With that said, a new feature to the latest version of this Braun epilator has “SensoSmart” which is a built in pressure sensor that ensures you’re applying just the right amount of pressure for with each pass for extra comfort. 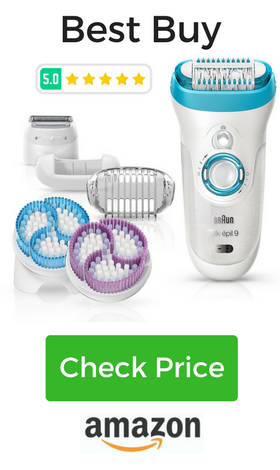 This is not a low cost budget product, it’s a top of the line Braun epilator kit, so expect to pay a high price. However, there is often online discounts to take advantage of, but in our opinion, it’s worth every penny. At the time of writing, we looked at over 500 customer reviews, 384 gave the Silk Epil 9-961e 5 out or 5 stars, resulting in an overall 4.5 / 5 rating, which is very high for any beauty product. Braun is arguably the best manufacturer of hair removal and shaving products, which is apparent in the Silk Epil 9-961e epilator.